I started off the day with a game of St. Petersburg. I haven't played for awhile, so I forgot about the strategy with ensuring that you will get a card in the next round by drafting a card you might not otherwise want this round. This ended up costing me a first-round Noble draft into hand and a second-round worker. I compensated with a worker upgrade, but I should have been able to do both. When I finally remembered the strategy, I wanted to kick myself. For the rest of the game, I was very careful about counting card slots. The best I could do was claw back to an almost-second place finish, but it wouldn't have mattered as Bill completely ran away with the game. I like card drafting, but I don't play this game too often because sometimes it feels robotic. Unfortunately, when you don't play, you tend to forget strategy. Them's the breaks. Next up was Fresco. I haven't played the game before, but I was able to read through the rules while waiting for it to start. The rules are simple enough, but I obviously won't understsand the strategy on my first attempt. I know two of the other players, so it is a friendly game despite being part of the national championship track. I started the final round in last place. When all the actions were done, I was in first place! Then points for money left over was counted and I was in last place again (Bill from St. Petersburg has taken first in this one as well). I was really excited when I saw I could vault into first, but I spent all of my money doing so. I didn't realize how much money everyone else would end up with. Quelle dommage. I very much wanted to play Dominant Species, but unfortunately it was scheduled to run from 2pm to 6pm and Titans of Industry was scheduled to start at 6pm. Consulting with others, that game can easily go over four hours, especially with new players. The GM said one session of it had gone to nine hours! Since all five of the other players were new to the game, I decided there would be zero chance of it ending on time. I bowed out. 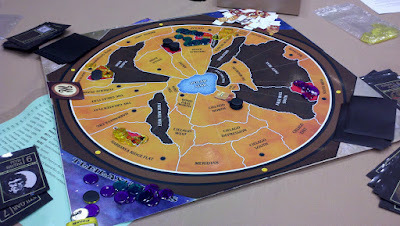 I ended up jumping into a game of Dune with three other players, two of whom had played before and taught us newbies. I was assigned the Emperor faction. I know people call this a classic, but I am unimpressed. A huge part of the game appears to be the Treachery (event) cards. These cards can kill opponents' Leaders or protect your own. Leaders are key to winning a battle. You are dealt one Treachery card at the start of the game, then can bid on new, unseen ones each round. I was dealt a card whose text said: "Worthless card." It actually said that. It turns out that of the forty-someodd cards in the deck, eight of them are completely worthless. Not only do these cards not help you, they count against your hand limit and you can only get rid of them in battle. I was pretty pissed at being dealt a worthless card when my opponents' had all potentially gotten a free card that could kill my Leader in battle. So, even though I was told the Emperor sits back in the first auction for more cards, I went ahead and bid so I could make up the deficit. I pay four spice (a lot) and . . . another worthless card. At this point, I assume I'm in last place as I've been dicked over twice so I have to shoot the moon to have any chance. I therefore bid on another card (still in round one) and . . . another goddamn worthless card. Second round, same logic applies as the first round, so I go after another Treachery card. I won't bother telling you what I drew, if only because repetitive storytelling is boring and there is a high likelihood I will have an explosive aneurism if I think about it much longer. What kind of massochistic [expletive] of a designer thought this was a good idea in a four hour game? I'm not a fan of Settlers of Catan (anymore), but it did development cards correctly. While there is randomness and you might not get the one you hope for, you get something. Dune 's design is a perfect way to forever alienate a player from a game, as it has me. I played it out, got screwed a few more times by another random card draw that unleased sand worms to eat my troops. My opponents also targeted me because, in this game, it's best to try to steal cities (win condition: three of five cities) from the weakest player. Which is fine, but it made being hurt early even worse. On the third-to-last turn, I managed to win a couple of tough battles and gained my second city. The next turn I swapped that for for a different one and the turn ended with myself and the other new player each having two cities and the other players being wiped off the board. When the final round began there was an opportunity to form an alliance. Two allied players can win the game together, but they need four cities instead of three. I saw there was about a 50/50 chance of me getting a third city and winning. However, I decided to ally with the other player instead of risk trying to steal one of his cities, failing, and the game ending in a four-way draw. So I pulled off a shared victory. I still hate the game. I will never, under any circumstances, even consider trying this painfully poor design ever again. After Dune, I ran to set up for my next Titans of Industry session. However, the event staff informed me that there was an error on the event schedule grids and both it and a session of Automobile were really scheduled for 7pm instead of 6pm (which I had thought as I was going by the grids). A player even showed up at six o'clock whom I had to ask to come back later, which felt crappy. And, of course, this meant I might have been able to play Dominant Species after all! Gah. Today is just out to get me. After no one else showed up for Titans of Industry, I met up with my friend Andrew Parks. While catching up, we got in a 3-player game of Small World. I took Bivouacing Skeletons in the first round. I built up to fourteen Skeletons before Anni and Andy knocked me down to nine, after which I never recovered. On my way to bed, I diverted to get a bottle of water and saw some people playing the new Star Trek: Expeditions game. I asked them what they thought and they were quite positive about it. I asked them if they were planning to play it again during the convention and they invited me to join them tomorrow. We arranged a time between my two scheduled playtests. Anni also said people have found it to be good, so I am looking forward to trying it out. I hope it will prove to be the nice surprise of the convention. I can't claim credit for having said anything about Star Trek: Expeditions. I haven't heard much about it at all. Maybe Doug said something? It's entirely possible I mixed up who said what. My memory is awful under normal circumstances, even when I'm not con-sleep deprived and writing at midnight. Sorry about that.